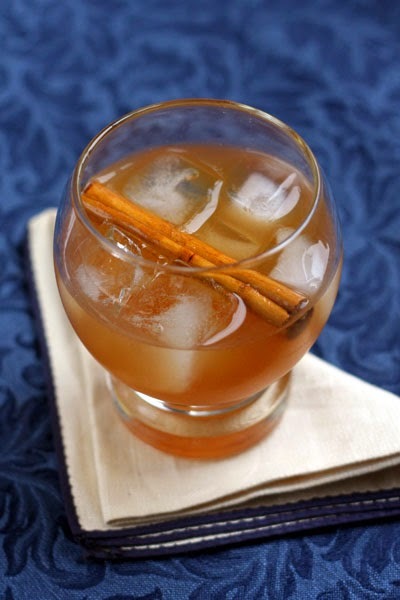 Spiced and sweetened with rum and maple syrup, this cocktail is perfect for winter's brief afternoons and long evenings. Plus, the teensy bit of apple cider at the bottom of the gallon jug has finally found its home! Combine ingredients in a shaker with ice; shake vigorously for 15 seconds and pour into an Old-Fashioned glass. Garnish with a cinnamon stick. I'm a sucker for simple homemade treats (every year at the holidays I make sea salt caramels), and infused spirits are some of the easiest food gifts on Earth. Smuggler's Cove, the San Francisco tiki institution, shared their spiced rum recipe, which I couldn't recommend more highly–for this or any other rummy cocktail! Do make sure you shake this cocktail vigorously, otherwise you may accidentally take part in the cinnamon challenge. Cheers! A cocktail with maple syrup and apple cider? Yes please! Hope your year is off to a wonderful start! You had me a maple syrup. Sounds like perfection a glass!